To protect this intellectual property and prevent the unauthorized copying of this software, we have used an industry-standard activation process. Activation simply enables you as a valid customer to confirm your license to use the products after purchase. So that you know what to expect during the activation process, we have described below the steps taken to activate MPMM on your work or home PC. If you are currently connected to the internet, we suggest that you choose the "Activate online" option. This quick, automated process will enable you to activate your license immediately, saving you time. To activate online, simply enter your Name, Organization and Serial Number (issued to you at the time of purchase) and select the "Register" button to finish. Within 2 minutes, you will receive confirmation that your online activation has been successful. MPMM will then be available for use. If you choose to activate your product by email, then simply email us the 'Serial Number' and 'Machine Key' displayed during the activation process and we will reply to you with a code to unlock the product. Enter the 'Unlock Code' into the fields displayed and the product will automatically activate and load. Note: These codes help us to ensure that you have installed MPMM on the number of PC devices for which you have purchased licenses. If you wish to activate later, then select "Continue without activation" and the product will immediately load for use. Note: You will have 14 days within which to activate your product. 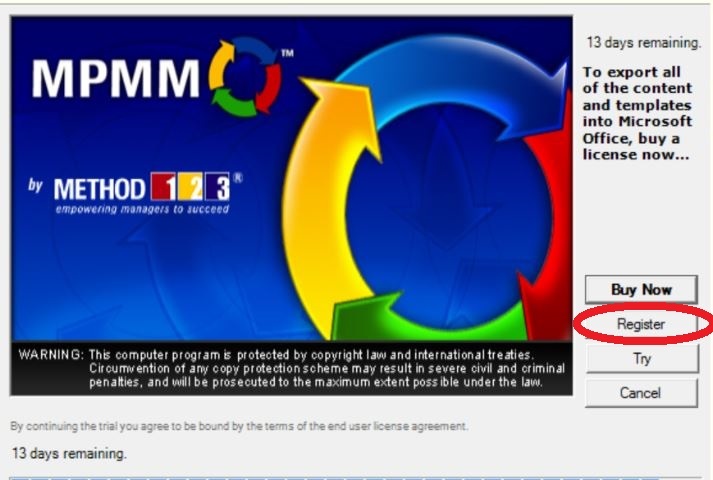 If you do not activate within 14 days, then MPMM will open in "Trial" mode, limiting the content available for use. You can email us at at any time, with questions regarding this activation process.